SOF News Update 20180622 – 11th SFGA reunion, a strategy for the Niger-Mali border, GB recovering from wounds – his story, SFAB recruitment, video – Swift Response 2018, SOF move to Baumholder, Aussie SF controversy, SEAL Delivery Vehicle virtual reality experience, Russia’s activity in Ukraine and Crimea, and more. 11th SFGA Reunion. Former members of the 11th Special Forces Group (Airborne) – a SF unit that had been part of the U.S. Army Reserves until 1994 – will hold a group-wide reunion on Saturday, August 11, 2018 at Fort Meade, Maryland. The reunion is held every two-years so former 11th SFGA members can get together to renew friendships, tell more lies, and have a good time. GB Recovering from Wounds – His Story. Read the inspiring account of how a Special Forces soldier recovered from his severe wounds in Afghanistan to include the physical, emotional, and mental obstacles that he had to overcome. “Military Vet Shares His Recovery Journey”, Slice of MIT, June 20, 2018. SDV Virtual Reality. The Navy SEAL Museum is now offering a SEAL Delivery Vehicle (SDV) virtual reality experience for guests. (TC Palm, June 21, 2018). Aussie SF Controversy and Strategy. The current problems of the Australian special Forces can be traced back to Australian strategy – or so says one author. Read “What does the special forces controversy tell us about strategy and force structure?”, The Strategist, Australian Strategic Policy Institute (ASPI), June 22, 2018. “Tinker, Soldier, Doctor, Astronaut” – SOF Doctor Going to Space. A doctor with a SOF background will soon blast off into space (well, maybe). “Meet the Special Operations Doctor NASA Plans on Shooting into Outer Space”, Task & Purpose, June 21, 2018. CT Spending Tops $2.8 Trillion. The U.S. government has spent quite a sum on counterterrorism efforts since the terrorist attacks of September 11, 2001. (National Defense Magazine, June 21, 2018). SOF Move to Baumholder. U.S. Navy SEALs and U.S. Army Special Forces units currently based in Stuttgart, Germany will be moving to Baumholder, Germany. The Panzer Kaserne in Stuttgart is very crowded for the 1st Battalion 10th Special Forces and Naval Special Warfare Unit 2. While a good move for the conduct of training and garrison infrastructure some special operators may find they will miss the cultural aspects of Stuttgart. (Stars & Stripes, June 13, 2018). Erik Prince on Afghanistan. Former Navy SEAL and Blackwater founder speaks his mind on the way forward in Afghanistan – taking a shot at the ‘conventional approach’ of the U.S. military. (Daily Beast, June 19, 2018). UAE’s Tribal CT Strategy in Yemen. The campaign by Saudi Arabia and the UAE to capture the Yemeni port city of al-Hudaydah is in progress. But that is not the only front that the coalition is engaged in. The UAE is quietly working with local Yemeni forces to stabilizing Emirati-controlled areas of southern Yemen. The UAE is attempting to use tribal militias to organize a ‘security belt’ within the southern Yemen region. Learn more by reading “Security Belt: The UAE’s Tribal Counterterrorism Strategy in Yemen”, Terrorism Monitor, Volume 16: Issue 12, June 14, 2018. Russia, Ukraine, and Crimea Examined. Two scholars examine the literature on the actions of Russia in Crimea and Ukraine. Read “The Causes and Consequences of Russia’s Actions Towards Ukraine”, E-International Relations, June 16, 2018. Russian Hybrid Warfare. A paper examines the Soviet origins of Russia’s use of hybrid warfare, cyber warfare, info ops, and assassinations. “The Soviet Origins of Russian Hybrid Warfare”, E-International Relations, June 17, 2018. A Strategy for the Niger-Mali Border. The Nigerien government and its allies have relied on military force to stem the growth and influence of jihadist groups. However there are some folks who believe that Niger should consider a political approach to the problem. The old CT vs COIN argument revisited? Read more in The Niger-Mali Border: Subordinating Military Action to a Political Strategy, Report No 261, International Crisis Group, June 12, 2018. (The executive summary is in English, the 42-page paper is in Francais). Video – SFAB Recruitment. Are you interested in a job advising foreign military forces? The U.S. Army’s Security Force Assistance Brigades (SFABs) have a job for you. Watch a one-minute long video explaining one advisors role in Afghanistan. Video – Transatlantic Global Response Mission. The 82nd Airborne Division based at FBNC conducted a no-notice mission into Latvia during the Swift Response 18 exercise. (U.S. Army, June 20, 2018, 45 seconds). 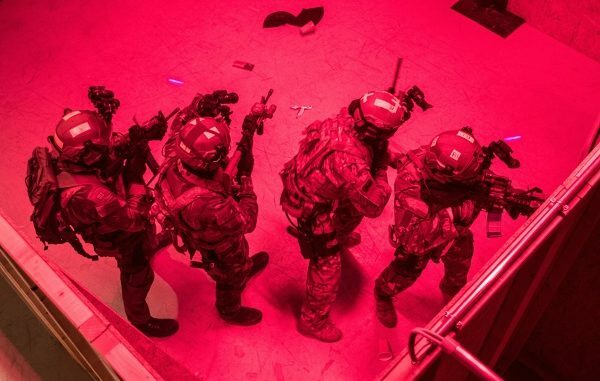 Photo: Special operations forces conduct close quarter battle (CQB) at the International Special Training Centre (ISOF) in Hohenfels, Germany. Photo by Special Operations Command Europe (SOCEUR) March 2018.